The four wheel drive adventure really starts today, from here for the majority of the next six days we will be out in the wilds of the high country. After breakfast, we break camp at 8:40 am and head up Abbeyards Road. Here we head south-west towards Cobblers Lake. The tracks starts climbing and it is mostly first gear high range for the first 30 minutes and a bit later we reach a helipad at 1085 metres. This has almost 360º views. It has taken 55 minutes to travel the 12 kilometres to this spot. We continue on and just before we get to Cobblers Lake, there are three waterfalls visible off to the right of the track. 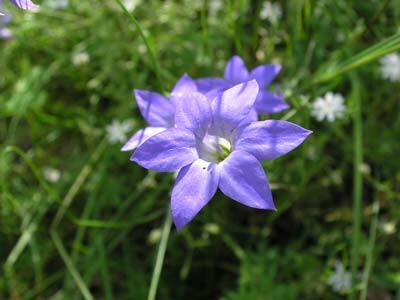 These are in full flow and drop a long way from the top of the cliff. 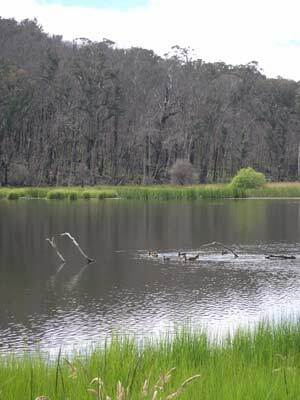 The waters are the outflow from Cobblers Lake and a nearby creek. 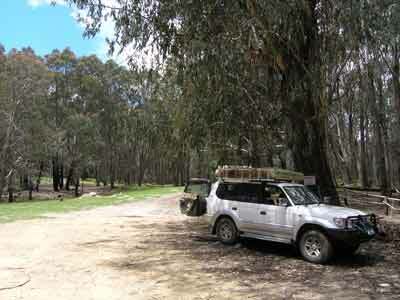 We reach Cobblers Lake at 10:20 am, having taken 100 minutes to travel the 23 kilometres. We have passed a couple of tracks on our right that provide a way around a hard spot past Cobblers Lake (more about this later). 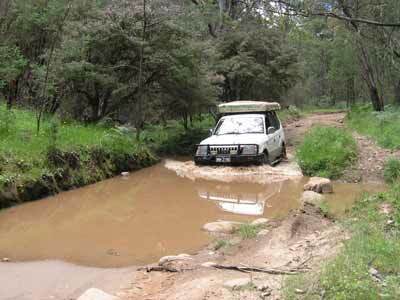 Cobblers Lake is off the main track so we make a diversion and check it out. This lake was alleged to have been created in the 1950s but I am not sure if it was natural and then enlarged. In any case, it is very nice and there are lots of waterbirds on it. There is a camping area (with BBQ, table and toilet), but this area was severely burnt out in 2006-7 and it has not recovered much yet. 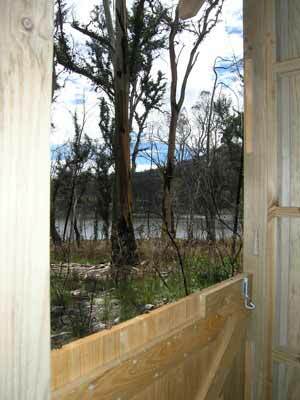 The toilet has an interesting split door that provides a great view of the lake as you go about your business (see the photograph below). 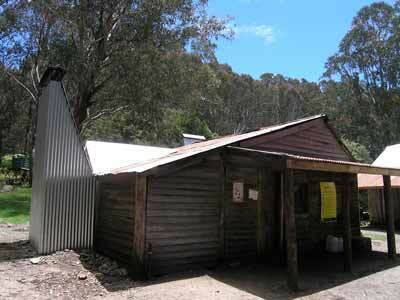 We have morning tea here and examine Cobblers Hut, the first of many huts we will see on this trip. 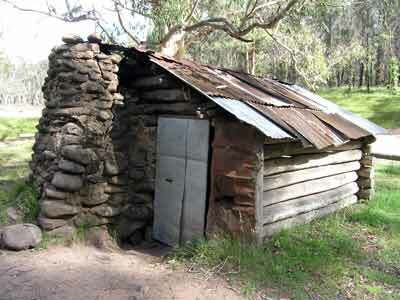 These huts were mostly built for high country farmers to provide shelter while looking after their cattle. While most have a heritage that goes back as far as 100 years, a lot have been rebuilt numerous times due to fires or natural attrition. Kelly walks along a section of the lake and takes a few photos and then we both go for a walk to the top of one of the waterfalls but there is no view of the waterfall itself. At 11:05 am we continue along the Abbeyards Road and soon come to the hard spot, The Staircase. This is a 1.5 kilometre long stretch that has a lot of rocky steps. However, the only really hard bit is one 20 to 30 metre stretch that causes me to bottom out a few times. It is not too hard (compared to many tracks around Sydney we have been on) but for a lot of people it would be very difficult. It is low range for this whole section and it takes us 12 minutes to travel the distance. From here the road is not too bad although we encounter the first water we have to cross. This is a very muddy waterhole but it is not very deep. We head onto King Basin Road. This follows the King River in a rough westerly direction. There are numerous crossings of the river, none too difficult as the water is neither deep or wide. 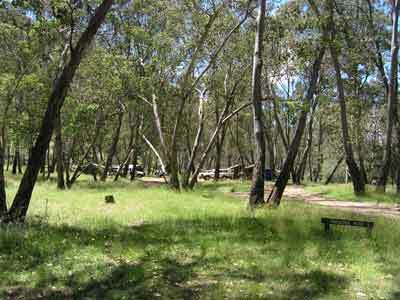 There are lots of good camping areas along the river and track, mostly near the crossings. We stop at King Hut. 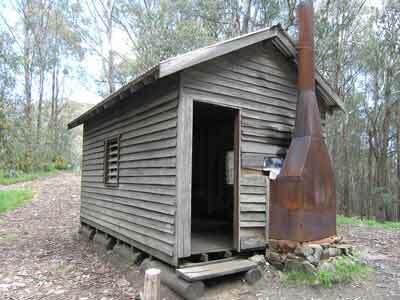 King Hut has an excellent Camping Area with a toilet. We get back on the road and cross the river many more times. At the intersection with Burnt Top Track, we are heading left but before we do, we go the short distance to Pineapple Flat Camping Area down to the right to see what it is like. It is quite good and large. It is also on the river and there are a few people camping here. There are toilets as well as tables and BBQs. We head back to the intersection and continue on. The road we are travelling on is still Kings Basin Road. We are again heading south and south-west. We a basically planning to do a large circle around the ski field of Mount Stirling (this appears to be a cross-country skiing area). 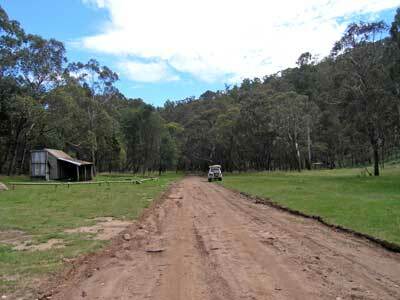 We come to the Circuit Road which is a good gravel road that goes right around Mount Stirling. We are only going to use short sections of this road as there is another more interesting track to use. At the Circuit Road we turn right and 2.2 kilometres up the track we come to an intersection. This is a bit confusing as I am looking for an unnamed track that cuts across to the south. We intend to take this track but I realise that the track to our left is the one I want. We first go to Razorback Hut which is just off this intersection. We arrive here at 1:20 pm. 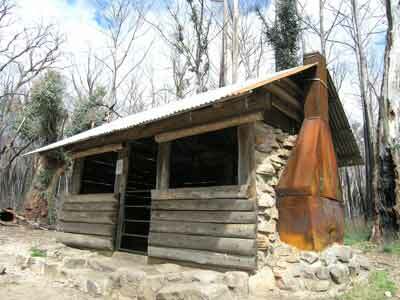 This is probably the best hut we see on the whole trip and it also has an adjacent accommodation bunkhouse. There is also an excellent Camping Area. There are tables, BBQs and toilets. This would be a very nice place to stay and we later encounter an older couple from Brisbane who stayed here a few days before. 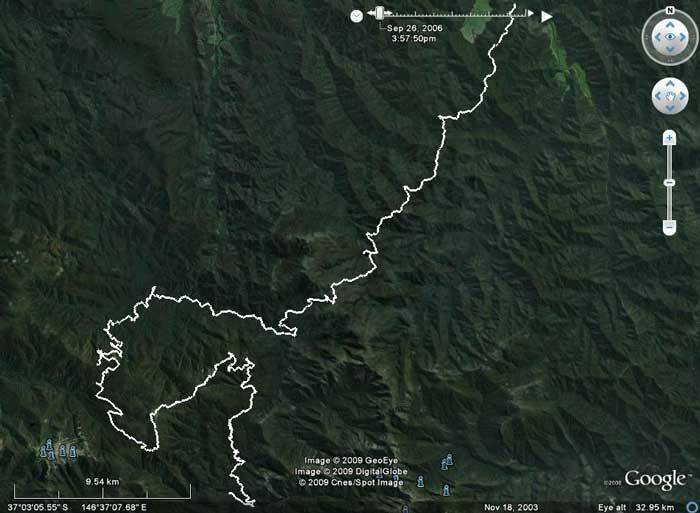 We leave at 1:40 pm and go back to the intersection and head along the unnamed road (it may be called King Saddle Road as it crosses King Saddle) and after only a few kilometres come to an intersection with the Circuit Road. This is called Telephone Box Junction but, guess what, there is no telephone box here. 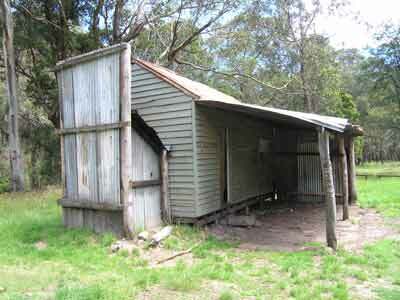 This obviously used to have one but now it is the main building for the Mount Stirling Ski Field. We turn left and follow this to the south-east for just over 7 kilometres to the intersection with Howqua Gap Road. 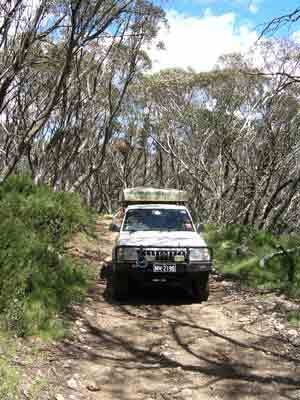 We go up this road and within 50 metres we see Howqua Gap Hut. You can also camp here. We follow Howqua Gap Road. This is a difficult track, very slow and we use mostly low range. We only average 10 km/h over the four kilometres to Mount Stirling and this is not a section of track to drive if you have little experience in four wheel driving. 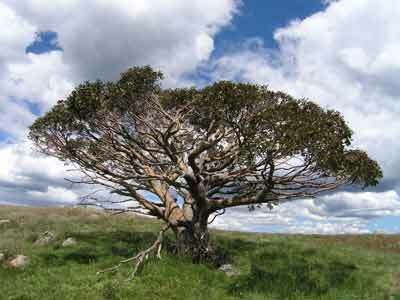 We arrive at Mount Stirling summit at 2:40 pm. This is the highest peak in the area apart from Mount Buller and at 1745 metres, has great 360º views to Mt Buller and other hills. The track goes between a gap between two peaks and it is only a very short walk from the rough parking spot to the summit. You can see the buildings at Mount Buller very clearly. I really recommend stopping here. The other peak to the south appears to be higher according to my maps (1748 metres) and it is worth walking there as well as it gives views down into Howqua Valley and back to the main summit. We spend 20 minutes time here. 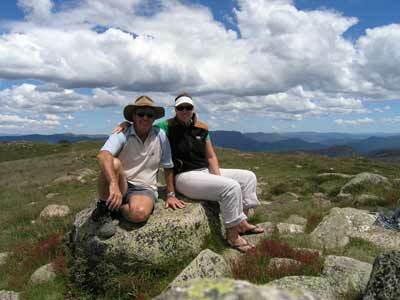 After Mt Stirling we continue to the north-east along the same track which here is called Clear Hills Trail. It is a little better track but still slow going. After just over four kilometres we come to a track on the left. This leads a few metres to Craigs Hut and we get there at 3:20 pm. 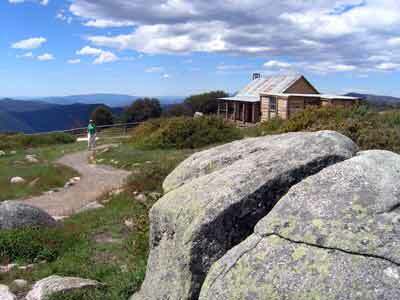 Craigs Hut was constructed for the 1983 movie, "The Man from Snowy River" which was partly filmed in this area. 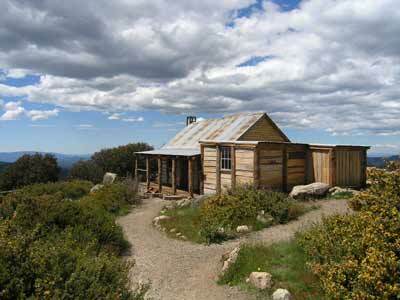 It was at first just a film set (not a real hut) but in 1993 it was rebuilt as a real hut. When we visit it is almost complete after being totally rebuilt again as it was destroyed in the 2006-7 bushfires. This is one of the nicest locations with fantastic views from the 1455 metre high spot. This has views for 180º to the north. You can also camp here if you like as there are pit toilets, a shelter shed, BBQ and picnic tables. Kelly wanted to stop here but I was not keen as we still had a lot of ground to cover if we were to keep on schedule. Next visit I will certainly plan to stop overnight here. There is also good camping a few hundred metres before you come to the track to the hut. From here we dropped down from the higher land to yet another intersection with Circuit Road. This is 2.2 kilometres from Craigs Hut. Here we turn right and follow the road for six kilometres where we pass the intersection with Speculation Road. We are following Circuit Road for a bit longer so we continue on it for another four kilometres to Bindaree Road. 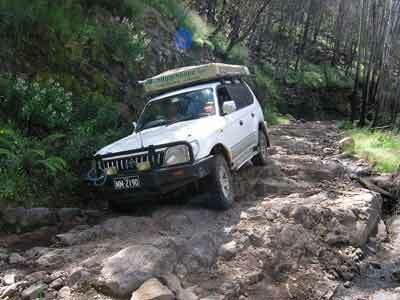 We turn left here and head to Bindaree Falls which are about 10 kilometres down this track. This is not well signposted as the sign is almost hidden. It is just as you cross a small bridge. 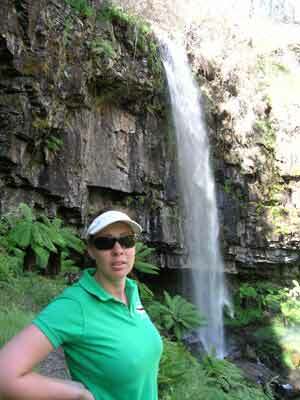 We walk the few hundred metres to the falls. They are quite small but interesting. You can walk behind the falls and it is a lot cooler here (it is a very hot day). It takes 15 minutes to walk up and back and at 4:25 pm we continue down this same track. A bit further down the road at the intersection with Upper Howqua Road, we turn right. 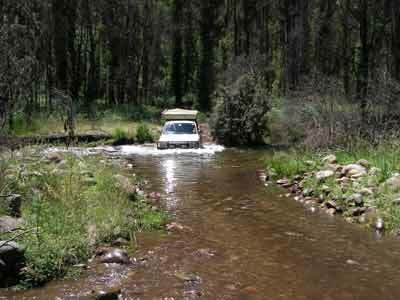 A few hundred metres on there is another road that comes off to the left and crosses the Howqua River. 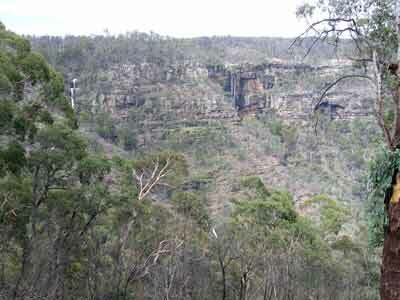 This is the Bluff Link Road. It also appears to be called Link Road and maybe 16 Mile Road although I suspect that this latter name is the name of the road to Bindaree Hut. We continue to the west and just past the river crossing there are some people camped near the river. 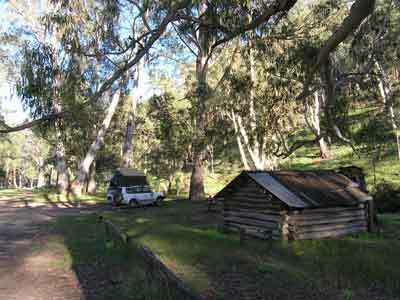 We continue along the track to Bindaree Hut and cross the river. This is right where the hut is located. It is 4:40 pm as we pull up. It is a very small and low hut. There is a very large camping area here, much nicer than where the other people have set up camp. We decide to camp next to the hut as there is a table and BBQ here. There is also a toilet about 150 metres away. We set up our tent and gear and go for a walk to collect some timber. There is only small stuff around, enough to get the fire going but no big pieces. However, there is a couple from Queensland a bit further up and they give us some timber that someone has left at their campsite. As we have gone along the last day, we have seen lots of rosellas. They are quite prolific and are normally seen flying away from the side of the track where they appear to be eating seeds. Tonight we also see a few yellow-tailed black cockatoos. There are less flies here and we have a pre-dinner drink and some left over Christmas nibblies. Kelly cooks chicken and cashews with rice and afterwards, I cook some scones in the camp oven for tomorrow's morning tea. Afterwards, we read some books we have bought along and go to bed about 9:30 pm but continue reading till 10:25 pm.